Description: Beautiful historic home proudly sits atop stone fencing in lovely taylor's daughters historic district in bellevue. 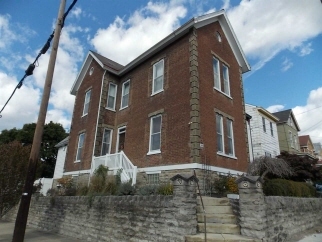 Character abounds in this 1890's 3 story brick home with large rooms, wood floors, natural woodwork, 2 antique fireplaces. Gourmet kitchen, lovely landscaping, private fenced yard, coveted 1 car attached garage (oversized-fits large suv) plus 1st floor laundry/mudroom! 3rd floor can be finished for bedroom or office. Home was previously set up as 3 bedrooms on 2nd fl but master was enlarged. Just down the street from shopping and dining. City view from upper levels.